Wed., Aug. 3, 2016, 10:30 p.m.
SEATTLE – It was a night when the Mariners honored Boston designated hitter David Ortiz, whom they signed 16-year-old in 1996. In the end, though, the night belonged to Hisashi Iwakuma. 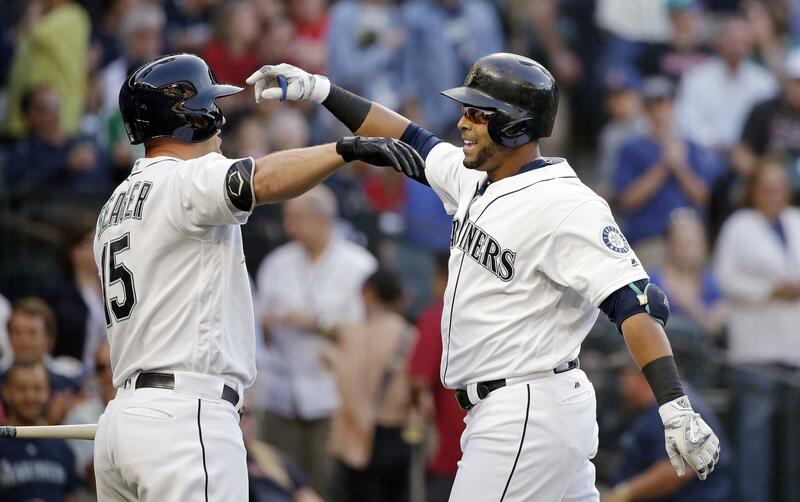 The Mariners also hit three solo homers Wednesday in a 3-1 victory over the Red Sox at Safeco Field. Those were their only hits against Boston starter Rick Porcello until Mike Zunino’s single in the eighth inning. They were more than enough. Iwakuma (12-8) limited the Red Sox to five hits, all singles, in 7 1/3 dominant innings before the Mariners turned to Drew Storen after Andrew Benintendi’s one out single in the eighth inning. At that point, Iwakuma was at 97 pitches and about to head through the Red Sox’s lineup for a fourth time. Storen gave up a single to Mookie Betts, which brought the tying run to the plate, but retired the next two batters. Edwin Diaz then wobbled through the ninth inning for his second save. Diaz gave up a one-out single to Jackie Bradley Jr. before hitting Aaron Hill with a pitch. A wild pitch moved the runners to second and third. Travis Shaw’s grounder to second scored Bradley and broke the shutout. But Diaz closed it out. For Iwakuma, It amounted to a breakthrough victory. He had entered the game with an 8.59 ERA in five previous starts against the Red Sox. He struck out seven and walked none. The victory lifted the Mariners to 54-52 and pulled them to within seven games of first-place Texas in the American League West Division. They are 4 1/2 games behind Detroit for the final wild-card berth. Nelson Cruz’s leadoff homer in the second inning opened the scoring. He jumped a 90-mph fastball from Porcello (14-3) for a 441-foot drive into the second deck in left field for his 27th homer of the season. Iwakuma allowed a single in the second inning, two singles in the third and another single in the fifth. That was it until the eighth. The Mariners didn’t get their second hit until the sixth inning, when Zunino led off with a 427-foot homer to center for a 2-0 lead. He has five homers in 12 games. Adam Lind extended the margin to 3-0 with a one-out homer to right in the seventh inning. It was his 16th of the year. That the Mariners’ third hit. Porcello pitched a complete game and gave up just the four hits. Simply put, new Mariners closer Edwin Diaz is already historically good. By striking out the side Tuesday in preserving a 5-4 victory over Boston, and gaining his first career save, Diaz boosted his K count to 52 through 26 innings over his 25 appearances. Strikeout No. 50 came in 25 1/3 innings and, according to research by the Elias Sports Bureau, no pitcher reached 50 quicker at the start of his career since at least 1893. That was eight years before the American League was founded. “You’re watching it every night,” manager Scott Servais said, “and it’s electric. It’s not easy to do that in this league. The hitters are so talented. They know where the barrel is. They know the strike zone. They see velocity. Published: Aug. 3, 2016, 10:30 p.m.